PSC was formed in 1982 but I don’t want to start there. I think you have to give some context and the background to what happened. I was brought up in a very Orthodox Jewish background. At that time the media and public opinion was overwhelmingly pro-Zionist in the wake of the 1967 (6 Days) war. There wasn’t a newspaper in the land which wasn’t supporting Israel. [The Independent wasn't yet yet existence] The only newspaper which even attempted at some balance was the (Manchester) Guardian, originally the most pro-Zionist of all papers under CP Scott. It was reviled, of course, as a result. I can remember when Jerusalem was captured by Israel in the 1967 War, the BBC correspondent, Michael Elkins, was more enthusiastic than anyone else. He was in fact an Israeli citizen. He was ghastly and awful but this was accepted at the time. Most people thought it was a very simple matter. The Jews wanted a little portion of somewhere to live in the Middle East and the Arabs were intent on preventing this and refused to make peace. The expulsions in 1947-48, the complexities never dawned on them. It was fortuitous that I broke from that. Partly because we had a school debate and I played the devil’s advocate. The Zionist Federation wasn’t happy about a Jewish school hosting a debate on the rights and wrongs of Zionism!. That began to open my eyes and then I went on a school trip to Israel, which was heavily subsidised by the Zionist Federation in order to get Jewish school students ‘aware of their roots’. The only place I liked was Jerusalem. They guided you around but if you had enough nous you spoke to people independently, which I did, particularly in Bethlehem, to ordinary Palestinian Christians to see what they felt about this benign occupation. That was 1968-9 and I was about 15. The other thing was that I became a socialist and a Marxist and participated in the anti-Springbok demonstrations against the South African rugby team. I joined a group which was the precursor of the SWP, called the International Socialists. There I met one or two other Jewish anti-Zionists. They were few and far between compared to today where Jewish anti-Zionism has really taken off and become a major headache for the Zionists because it deflects the accusation of anti-Semitism but that was the position in the 1960’s in the wake of the 6 Day War. The massive expansion of the settlements began under Menachem Begin who became Israeli Prime Minister in 1977. That was the climate for the beginning of a a solidarity movement. I joined the British anti-Zionist Organisation which was controlled, although I didn’t realise it at the time, by the Iraqi Ba’athists and the and this was always a problem for any solidarity movement, retaining one’s independence. But there were other major initiatives. One was a Labour movement conference in Bradford, around 1981, where I met with Andrew Hornung, a member of Socialist Organiser, a precursor of today’s overtly pro-Zionist Alliance for Workers Liberty, which was then anti-Zionist, and decided to form a Labour Committee on Palestine. When SO moved into the Zionist camp Andrew left the organisation. 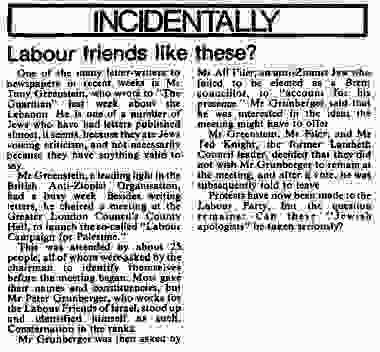 At a well attended meeting at the GLC’s County Hall, in July 1982, we ejected the organiser of the Labour Friends of Israel, Peter Grunberger and set up the LCP as a formal organisation. 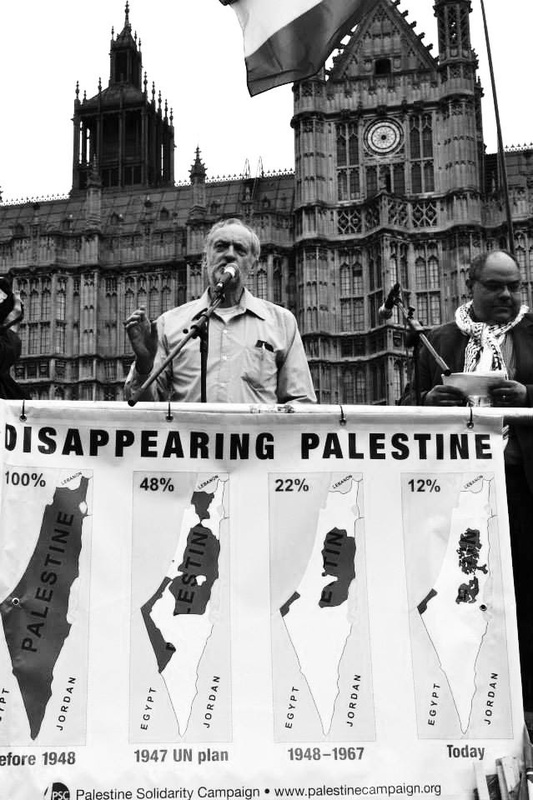 In the wake of Israel’s invasion of Lebanon, in which 20,000 were killed and Beirut was heavily bombed, the LCP introduced an emergency motion to the Labour Party Conference that autumn, calling for a democratic, secular state in Palestine. The resolution was actually passed! I had been elected as its Chair and Andrew as the Secretary and Ted Knight, leader of the Labour group on Lambeth Council was Treasurer. 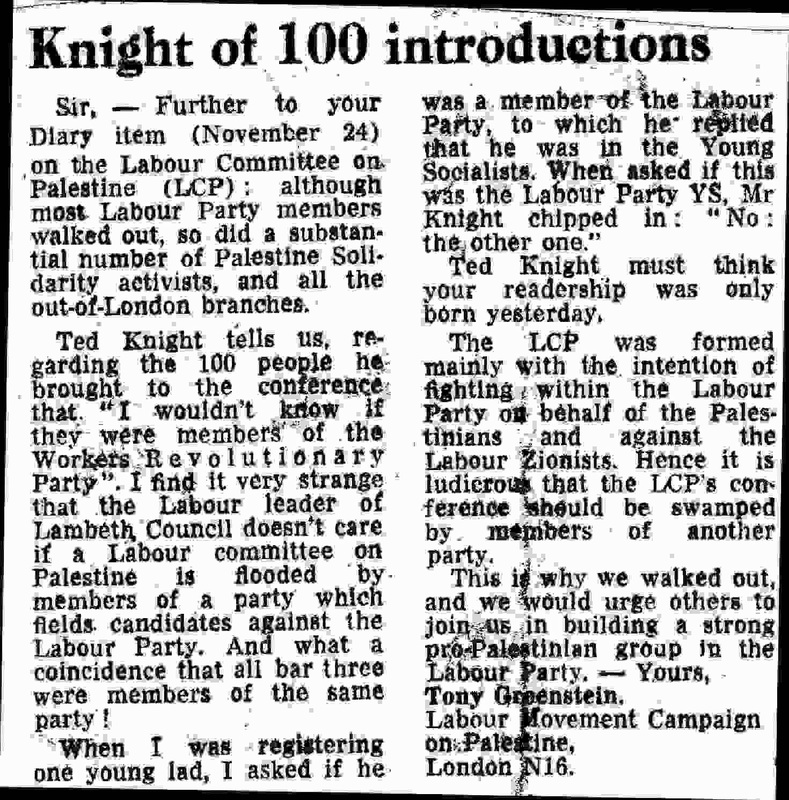 However unknown to me and others, Knight was an operative in the Labour Party for the Workers Revolutionary Party of Vanessa Redgrave fame, working behind a paper called the Labour Herald, which Livingstone helped front, and it was funded by various Arab regimes. The LCP was a useful trophy to display to its funders to demonstrate its political prowess. At its founding conference in November, some 100 WRP delegates, most of whom didn’t even know why they were there, trooped in to vote accordingly and we left to form the Labour Movement Campaign on Palestine. We got a good story about what happened published in the Diary column of The Guardian (Knight of a 100 Introductions). The LMCP organised with the early PSC a Labour Movement Conference on Palestine at the Greater London Council’s County Hall. At the latter, many of the luminaries of the Labour Left spoke – Jeremy Corbyn MP, Peter Tatchell, Richard Balfe MEP (now a member of the Tory party!). On the day of the Conference the Zionists tried to sabotage the Conference by sending out fake letters in my name with a badly forged signature, cancelling the conference! However the ploy failed. But remember the context. In the Labour Party for example the most ardent supporters of Israel were on the Labour Left, the Tribunite Left. Tony Benn and Eric Heffer. Stalwarts of the Left were members of Labour Friends of Israel. One of the things that has developed as a result of the 1982 invasion of Lebanon was that the Left began to reject Israel with few exceptions (Jo Richarson MP). The old Ian Mikardo wing disappeared or died out. People on the Left supported the Palestinians whereas those on the Right, the New Labourites, made it an article of faith to support Israel. That wasn’t always the case. In Liverpool I remember, with my school, attending a debate where the only pro-Arab or Palestinian speakers were either from the Labour Right, people like Christopher Mayhew MP or the Guardian journalist, the late Michael Adams. He was the first journalist I can remember who was not pro-Zionist. One of the Guardian’s correspondents and was rather shabbily treated from what I recall. He was the first journalist to speak out against Israel’s ‘benign occupation’. 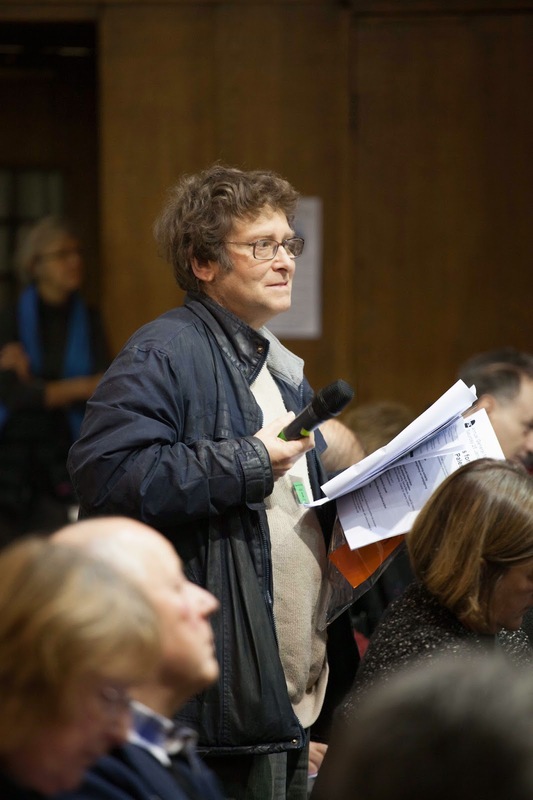 PSC AGM Notice with Omar Barghouti as speaker - At this meeting one of the leading Atzmonites, Francis Clark-Lowes, was expelled for holocaust denial, something Omar applauded. I can only describe the background to the growth of a solidarity movement from my own perspective. 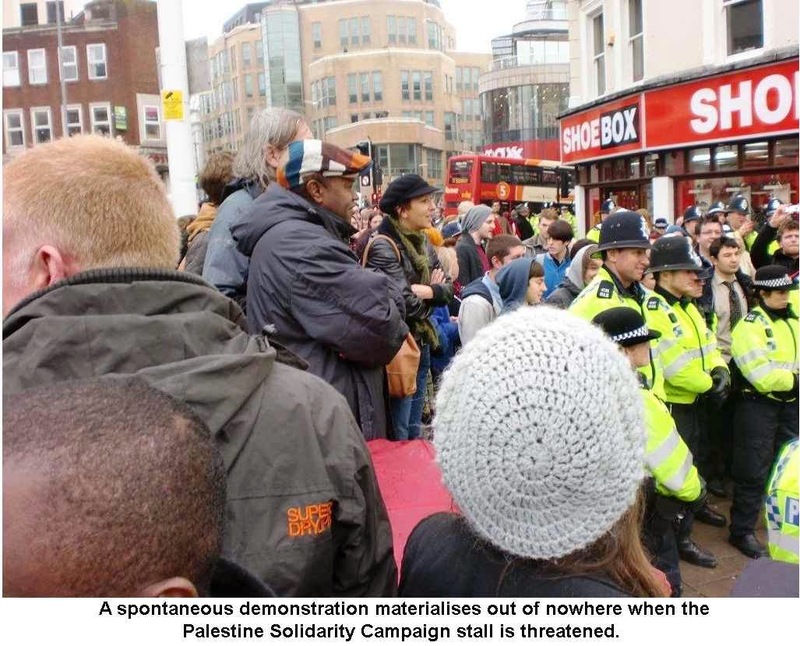 I came down to Brighton in 1974 to Brighton Polytechnic and there was established by General Union of Palestinian Students a quite thriving Palestine society. It was the days of very low-cost fees when you would pay £100-150 to get on a degree course, which now cost thousands of pounds. So there were a lot of Palestinian students on Engineering and Science courses. There built up an alliance between overseas students and the White left whereby a sleepy, reactionary and backward student union was captured by the far-left. I was elected as Vice-President of the Student Union, two years in succession. In Xmas 1977 I moved the first ever motion at the National Union of Students Conference supporting a democratic, secular state in Palestine. It didn’t win of course, but it set down a marker for things to come. In the student movement, in the 1970’s, Palestinian organisation and opinion in Britain was taking root via GUPS. It wasn’t like now where Fateh are wrapped up in the Palestinian Authority. I remember two of the activists. Hannah, a bespectacled Ph. D student who went back to Jerusalem who was aligned with the Palestinian Communist Party and there was someone I called Brother Joseph, who I saw for the first time in a decade at the first Gaza demonstration in London, who was a member of the Popular Front for the Liberation of Palestine and firmly on the left of the movement. Unfortunately he is very ill now and going blind. These were some of the unspoken about heroes of the beginnings of the solidarity movement in this country and at Brighton Polytechnic, which was more active on Palestine than Sussex University, where there was also a Palestinian Society. There was a burning need for a national solidarity movement which was given the necessary impetus by the 1982 invasion of Lebanon. People don’t recall but there was a precursor to the invasion where Israel went in and the United States under Reagan (!) forced it to withdraw. Then it went back in for a major invasion, using the pretext of the attempted assassination of the Israeli Ambassador to London, Shlomo Argov. In fact the attack was by Abu Nidal, a renegade PLO member living in Iraq and controlled by the Ba’athists. It was nothing to do with the official PLO but any excuse was sufficient for Israel to go into Lebanon, as we have seen in the attack on Gaza. The carnage it caused was a catalyst for the solidarity movement in this country and world wide. The image of Israel as a peaceful state, beleaguered on all sides, was shattered. Benn, Heffer and a number of Labour left-wingers resigned from Labour Friends of Israel. Gradually the Palestinians began to have a voice in Parliament. Not always a useful voice, for example Tony Marlowe, Tory MP, Monday Club member, for Northampton North who was more of an anti-Semite than a supporter of the Palestinians. But there was a coalescence among the Labour left that you’d never ever seen before. I personally began writing a whole series of articles for Tribune, house paper of the Labour Left and George Orwell’s former paper. These were a sign of the times. The New Statesman was another paper which swerved from support of Israel to criticism of it. Ariel Sharon had achieved quite a bit during the invasion of Lebanon, including complete revulsion for what Israel had done. It was after the initial false start that a group of people, it must have been about 15 or 16 people, came together at the University of London Union in Malet Street. Besides myself there was Jeremy Landau, Helen Stollar, who I met at the most recent Brighton demonstration and is ill now. There was Roland Rance of Jews Against Zionism, Moshe Machover and Haim Skotario of Matzpen – the Socialist Organisation in Israel. Moshe’s article The Class Nature of Israel which New Left Review published around 1968 and the International Socialists published as a pamphlet later is, even now, extremely worth reading, even after more than 30 years. Machover was a brilliant speaker on Zionism and is, despite his age, still active. There were a number of others, most of whom I can’t remember, Over half the meeting was Jewish! 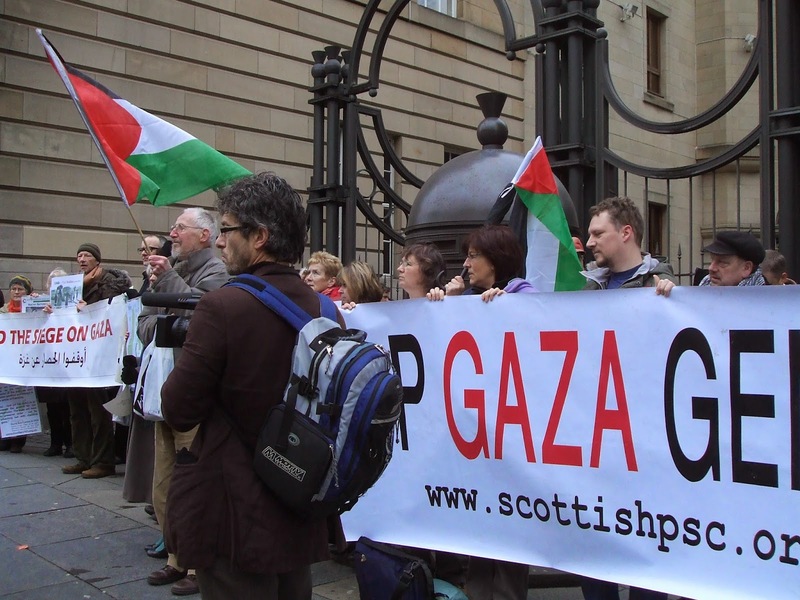 There were people like John Gee, the future Chair of Palestine Solidarity Campaign. There were a number of Palestinians and one very vociferous, outspoken and articulate member of the Lebanese National Movement. Because Israel had ensured, via Assad’s Syria, that the Left did not win the civil war. The aim was to ensure the victory of the fascist Phalange, in order to prevent the unification of the Lebanese nation. In 1979, along with a group of others, we visited Lebanon. The Embassy in Britain was controlled by the Phalange and they refused us visas. So we went to Syria first and after a couple of days, we were taken off by the PLO in a jeep across the border, without any visas of course. We were taken by this mountain of a guy. It was very difficult as you go up on the hills above Damascus and see the city shimmering in the night. It was a wonderful scene. It was semi-desert and there were traditional villages and families by the roadside, with tents and lanterns, selling fruit. We were taken to Beirut where we stayed at a hotel called Triomphe, which the PLO controlled. Three years later the Israelis bombed. It was tragic. We visited the refugee camps of Bourj-al-Barajneh, Sabra and Shatilla. The people we saw were lambs to the slaughter three years later, as the Israeli troops lit up the night sky with flares as their fascist friends in the Phalange butchered them, after the PLO fighters had left Beirut under an American sponsored agreement. I can remember, with another member of our delegation, crossing the frontier to Christian (East) Beirut from West Beirut, to see Tel al Zataar, a refugee camp, where some 2,000 Palestinians were massacred in August 1976. This was a consequence of the Syrian invasion of Lebanon, which the USA and Israel had given the green light to, in order to help the Phalange which was in danger of being defeated by the leftist Lebanese National Movement, which included the Druze of the Bekaa Valley. You saw the destroyed buildings with massive gaping holes where the shells had pierced. That was a precursor to the Sabra and Shatilla massacres. We were arrested on the way back, for not having visas, by the Lebanese army, which was few in number and dug in behind sand bags in the strip dividing Beirut. We told them we were guests of the Syrian government and were released pretty quickly! Back in London, PSC was formed three years later, in 1982, and they were small beginnings. We met I think every 2 weeks in Oxford House, a trade union and community centre in Bethnal Green and I would estimate that after a year we only had a couple of hundred members. If we organised a demonstration we‘d be lucky if we got more than a couple of thousand people. When we look back to the monster demonstration on 9th August 2014 we can see the major advances in PSC since that time. Growth in PSC was slow but steady. PSC took over, two offices in a shabby building, which housed other voluntary and campaigning groups, in the backstreets of London near Finsbury Park Tube Station and after about a year we began employing a part-time worker. I can remember that one of the workers was Anne Gray, who is still active on the Left and in PSC. We publicised ourselves at the various GLC festivals on the South Bank of the Thames, anti-racist festivals and similar gatherings. 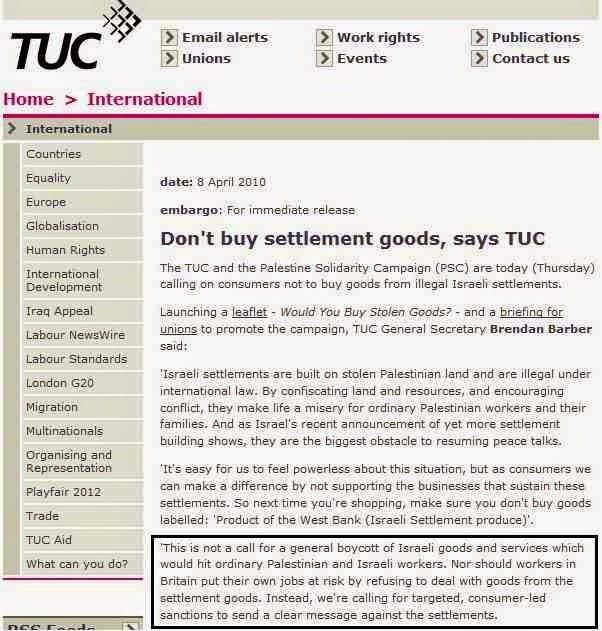 PSC also worked with the Labour Movement Campaign for Palestine and held public meetings and displays. Slowly but surely PSC gained name recognition. In particular PSC organised, in Camden Town Hall, a major conference on Anti-Arab racism, funded to the tune of about £2,000 by the GLC (which Thatcher abolished and was headed, in his radical days, by Ken Livingstone). This produced a major outcry from the Zionist Establishment and the Jewish Chronicle famously wrote that there was enough Arab money within a stone throw of Marble Arch. It was picketed by Herut, the dominant party of the Likud coalition in Israel and the ‘Marxist’ Zionists Mapam. We let a few of the latter in (we had heavy security) given the campaign against the Conference. I objected vehemently to this racist statement (substitute ‘Jewish’ for ‘Arab’ and see why) and after the Jewish Chronicle refused to carry a letter from me I submitted a complaint to the Press Council (the precursor of the Press Complaints Commission). Much to the Editor, Geoffrey D Paul’s surprise (his main defence was that my letter was too long and ‘boring’) and also my surprise, the PC upheld my complaint and the Jewish Chronicle was forced to print the adjudication, though it also printed an angry self-righteous defence. There have of course been setbacks amongst the Palestinians, notably the 1993 Oslo Accords. This had a knock-on effect on PSC which held an Emergency General Meeting and voted by 2-1 to support the Accords. 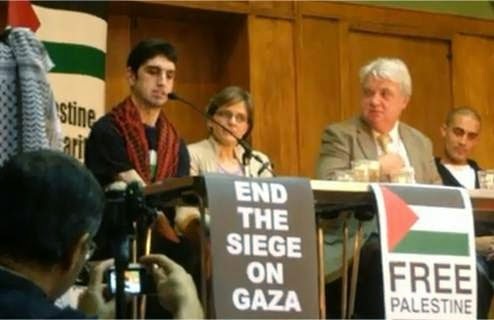 Later the Chair of PSC, who chaired the meeting, with Uri Davies from Israel at his side, told me how wrong he had been. But regrets after the Accords had been agreed were worthless. A number of us resigned from the organisation because, as I wrote in National Labour Briefing (in a debate with Julia Bard of the Jewish Socialists Organisation) this was the biggest setback to the Palestinian since the Nakba. It was a historic defeat. Everything I wrote then has, unfortunately, turned out to be correct. All that has happened is that the faces of the Israeli military have been replaced by that of Palestinians, trained by the Americans and supplying every ounce of Intelligence that the Israelis require. It is a major obstacle on the road to liberation, to which the Palestinians have to find their own answer. I rejoined the organisation locally in the early 2000’s at the suggestion of the then Chair Frances Clarke-Lowes (who ironically I played a major part in having expelled nationally and locally for holocaust denial). 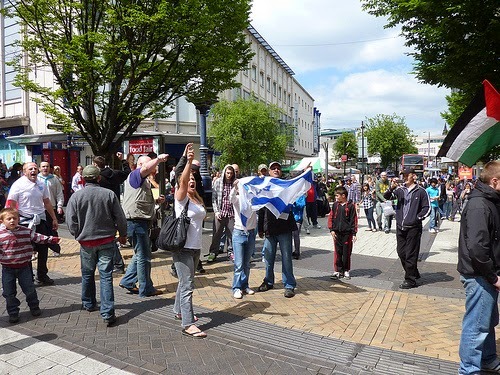 I had taken part in a demonstration from Palmeira Square to Brighton on Palestine, as a result of one of many Israeli attacks on the Palestinians and Lebanese. 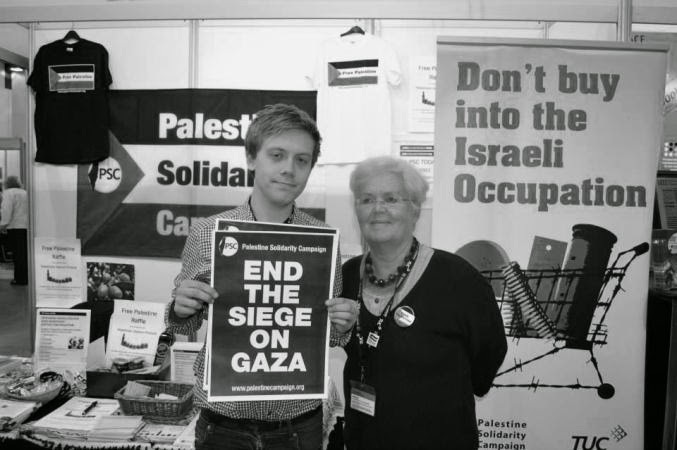 But I returned in earnest in 2005 when a friend I knew from the Left, Sue Blackwell, a lecturer at Birmingham University, spearheaded the first major BDS campaign in the Association of University Teachers, later the University College Union. 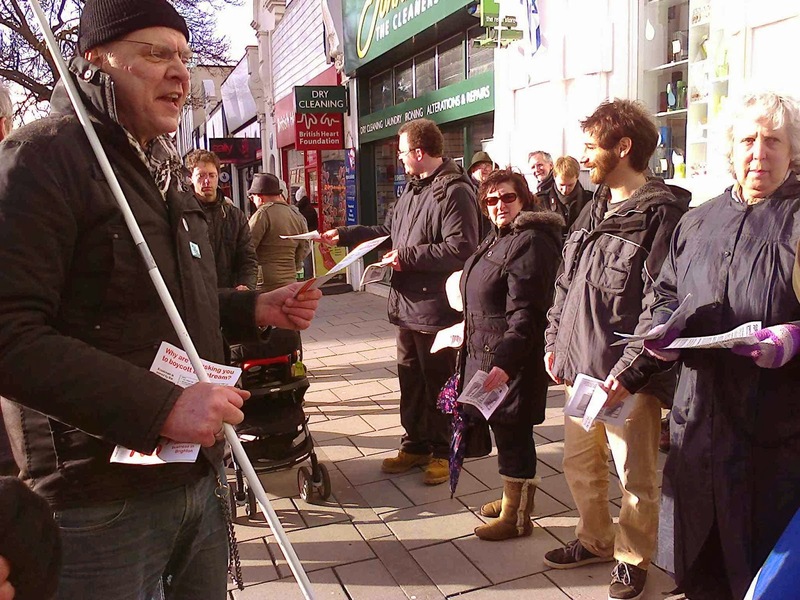 AUT held a national conference in Eastbourne and she nagged me to go over and leaflet it, which I did, as did other Brighton PSC members (Zoe I remember) and the resolution passed narrowly. That caused an uproar, Tony Blair condemned it as did most establishment worthies. But UCU held on, despite its leadership (the Left later captured the Executive) and we saw the culmination of Zionist lawfare tactics with the bringing of a case last year at an employment tribunal by Ronnie Fraser, a minor academic, alleging racial discrimination against UCU. In reality Fraser was just a front man and the eminence grise behind the case was none other than Anthony Julius, an ardent Zionist and former lawyer to Princess Diana, who trousered some £2m from the charitable trust set up in her name after she had died. Julius, whose speciality is clearly not employment law, was out of his depth in trying to argue that being a Zionist is a ‘protected characteristic’ (protected characteristics for example age, sexual orientation, gender, race etc. are the grounds upon which you can sue for discrimination and harassment). The problem, as the Tribunal noted, was that many Jews are also opposed to Zionism and the Tribunal held that the litigation was “an impermissible attempt to achieve a political end by litigious means”. 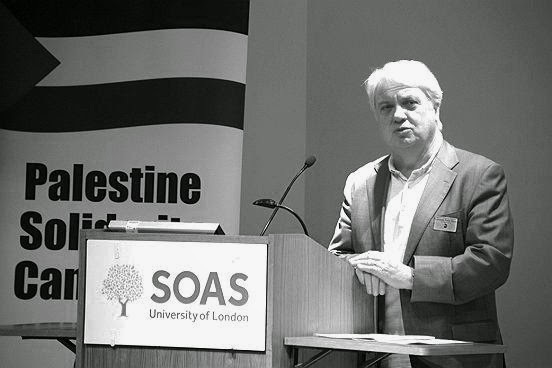 For a damning indictment of Zionist tactics and a defence of the Tribunal, from a Zionist lawyer see ‘Why the Ronnie Fraser case against the UCU was a legal and public relations disaster’ . After the successful motion to the AUT Conference in 2005, a group of us were invited for Sunday lunch to Stephen and Professor Hilary Rose where the academic boycott group BRICUP was discussed and tactics planned. Also in attendance was Betty Hunter, the then General Secretary of PSC who asked me why I didn’t rejoin PSC. I mentioned Oslo and she said that today that was irrelevant, everyone opposed it now and as a result I felt it was churlish not to rejoin.